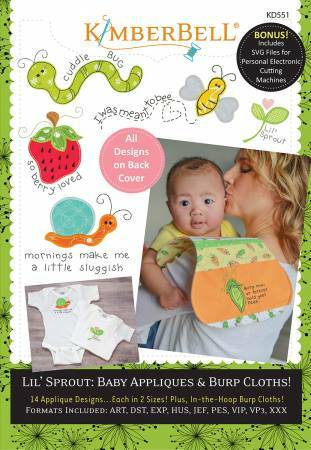 Fourteen garden fresh designs are paired with botanic baby sentiments for your “Lil’ Sprout” or “Cuddle Bug”. Choose from fruits and vegetables, like a “so berry loved” strawberry or “home grown” carrots, or cute critters, including a snail that’s feeling a little sluggish and an “un-frog-ettable” wide-eyed frog. Each design features both applique and embroidery which will be darling stitched on a burp cloth, bib, blanket, or onesie. BONUS In-the-Hoop Burp Cloths Included! Made for embroidery on the softest flannel, our burp cloth design comes in two sizes perfect for keeping your Lil’ Sprout clean from sneaky dribbles and not-so-sweet spit up. Whether you choose the solid or striped burp cloth, Kimberbell’s innovative in-the-hoop pattern, allows you to add the embroidery design before the front and back are sewn together. Finish the burp cloth in sewing mode by topstitching just around the edge. 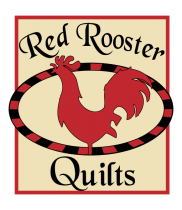 14 applique designs - each in 2 sizes: 4x4 and 5x7. Bonus In-the-Hoop Burp Cloths (Pieced or Solid): 8x12 or 9x14 hoop needed.